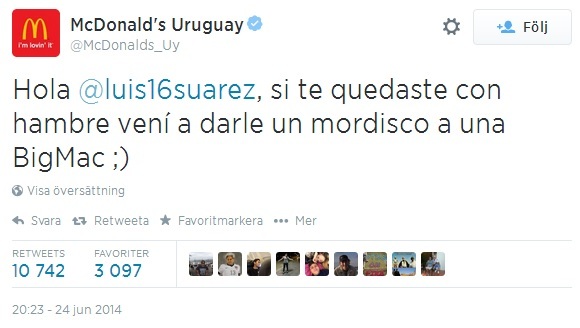 Uruguay striker Luis Suarez is a controversial football player to say the least. His history of scandals on the pitch is lengthy and another chapter was added today during the FIFA World Cup 2014 in Brazil. During the game against Italy, Suarez suddenly bit Italy’s Giorgio Chiellini in the shoulder. This was the third time he bit someone during a game as he had previously bit PSV Eindhoven’s Otman Bakkal and also Chelsea’s Branislav Ivanovic. Both times he got lengthy bans. Reactions to the tweet were initially mixed but it quickly got thousands of retweets. What do you think? Genious or tacky? “40% are students, 20% employees and 15% self-employed. Half of them are “mature” bloggers active for more than 6 months, while 9% are newbies who have just started blogging. The survey also found that the Italian blogosphere grows at a 5% monthly rate. Disclaimer: The fact that Italian bloggers are mainly young, might be an effect of the survey only interviewed respondents aged 20-35. I am not sure this is the case, but this page suggests that it is. The respondents have also answered questions about the reasons why they started blogging, but I only found notes about this in Italian (and Babelfish doesn’t give a perfect translation). If anyone has more details in English I’d be happy to read it so I can compare with my Swedish survey. More country specific blog research can be found here: Iran, Poland, Sweden (pdf), USA. Last week Italian TV channel RAI lost two leading profiles that resigned in protest of Silvio Berlusconi’s increasingly strong grip on Italian media. The chairman of the board at RAI, Lucia Annunziata, said that RAI had become a “mailbox for Berlusconi’s demands”. Accordingly, Italy now drops in Freedom House’s press freedom rankings. For the first time since 1988 a Western European country apart from Turkey is now ranked “partly free”. The press in all countries in Western Europe apart from Italy and Turkey are considered “free”.